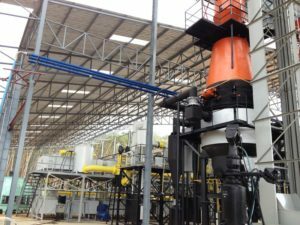 The gasification process includes four stages, each occurring in one of the four separate zones within the gasifier: drying, pyrolysis, oxidation and reduction zone. In the drying zone, moisture in the feedstock is evaporated by the heat from the lower zones at a temperature of 150-200 degrees C. Vapours move down and mix with vapours originating in the oxidation zone. A part of the vapours is converted into hydrogen in the following chemical reaction: С + H2O <=> CO +H2 with the remainder being retained in the producer gas. Located below the Drying Zone, temperatures here reach 400 to 650 degrees C. Pyrolysis reactions occurt temperatures above 250 degrees C. During pyrolysis, large molecules such as cellulose, polycellulose and lignin, are broken down into medium-chain hydrocarbons and carbon (charcoal). 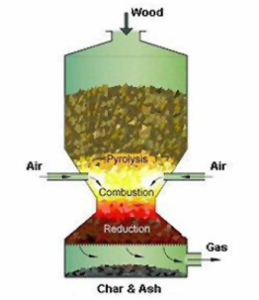 Pyrolysis products then move down towards hotter areas within the gasifier. Some of these burn while the others break down further into smaller molecules and atoms such as hydrogen, methane, carbon monoxide, ethane, ethylene, and others. These reactions release large amounts of heat (401.9KJ/mol and 241.1 KJ/mol) that increase the temperature inside the gasifier to 900 – 1,200 degrees C. This assists with burning off a substantial part of tars that would otherwise condense further downstream. These reactions are endothermic and reduce the temperature of gas exiting the Oxidation zone as it passes through the bed of charcoal at the bottom of the gasifier. Producer gas in its final chemical composition is formed in this zone. Upon leaving the gasifier this gas has a temperature of 250-500 degrees C and can be fed to burners or, after additional cleaning and cooling, fired in internal combustion engines.